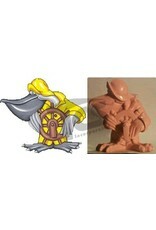 “AzbroWax” is the highest quality casting and carving wax for the professional sculptor, model maker and jeweler. 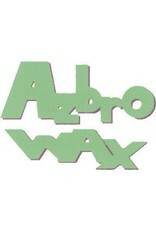 “AzbroWax” can be carved as is or melted and poured into a mold. The material is sturdy enough to handle light machining and hold the sharpest detail. 1. Prepare your mold by gradually heating the surface in an oven or with heat lamps. Apply a thin coating of a dry mold release to the surface prior to pouring. When heating, especially if using a microwave, heat in small increments to avoid melting the mold. 2. Melt the AzbroWax in a pot over a low flame or hot plate to around 225oF. Do not heat too fast (be patient!) as you may burn the wax causing smoke and the formation of bubbles when you pour. Stir constantly; as the materials may separate while hot. Use a thermometer to measure the temperature. Once the liquid wax has cooled to around 160oF, carefully pour into your well released, heated mold or form. Castings should be vacuumed or pressured to remove any bubbles. Allow the mold to sit for a few hours before de-molding the casting. Remember the middle (core) of the casting takes a while to fully solidify. 1. For best results, gently secure your piece in a vice or similar contraption to prevent movement of the wax. 2. Begin shaping and modeling the wax with heated and/or sharp tools. We suggest a wax tool, as it has a controllable thermostat. Add your details with either hand or power tools. When detailing the AzbroWax with high-speed rotary tools always use water as a lubricant. Smooth your surfaces with sandpaper, then buff with high-grade abrasives or nylon stockings and solvent (lamp oil or citrus shine). The final buff, to achieve the maximum shine, should be done with water. Do not use a solvent for the final buff, it will dissolve and disturb your surface.TipsDO NOT use an armature in your castings. This formula has a 4% shrinkage. Therefore the cast will crack around the armature as the wax cools and shrinks.Before pouring the wax measure the temperature carefully with a thermometer. If it is too hot the AzbroWax may bond to the mold surface.To adhere AzbroWax to itself, melt both pieces and stick together. If only one side is heated once the wax cools it will pop right off. This can be used to an advantage if you want to make a multi-part mold - parts that are not “welded” will come apart cleanly.ToolsInvest in various fine-sculpting tools or a Wax Pen, specially made for wax with a variety of interchangeable shaping tips. AzbroWax can also be carved with electric tools such as a Dremel with various cutting burrs. Remember to always use water!